Greetings! A busy summer season flew by and we are already well into fall. I recently lunched with Alessandro Bellini of Viola Imports and three colleagues from Italy at Spiaggia Café, which started the new season on a good note. It’s amazing how excited five guys can get talking honey, balsamic, and cheese. Although it helps if you are the artisan or the importer, just about everyone Italian has something special to say about everything that is put on the table. These conversations can go on for hours, with new and great friendships often the result. There is something so primal, so close to home that is awakened when we reflect on what tastes good. We are easily reconnected with our past and with those we love, and so many memories come back to life. At Spacca we never tire of these food conversations; it is part of our culture here. We welcome your sharing memories — so come round for a conversation ‘a tavola’ — it’s all part of the fun. We are working with new offerings that pair well with the cooler weather, including soups, antipasti, pizze, and dolce. “It tastes like fall,” said Chris, one of our wait staff, when sampling one of the new pizzas, our “Agricola” with roasted leeks, pancetta and burrata. The idea for this pizza came while sampling Amarone wines from Masi Agricola Winery near Verona. As pizza often becomes a topic of conversation when I am present, the U.S. director for this wine estate eagerly shared this favorite of his with me. Another pizza forthcoming is the Neonata. Newborn ice fish blended with spicy peppers and oils are called neonata and come to me from Alessandro of Viola. I have been asking him about this product ever since returning from the Cilento coast last April. 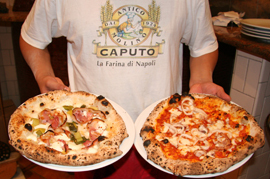 I had pizza with neonata at Europeo di Mattozzi in Napoli that same visit. To be honest, I do not remember if that particular pizza was more spice than fish, so I have decided to add seppioline, as an additional topping. Small cuttlefish (seppia) are sauteed in oil and garlic, blanched in white wine, then finished over the char broiler. First comes the neonata, then the seppia; mozzarella is the final touch. If you like spice and fish, you will like this one! Another fish already on our table is Baccala or salt cod. Popular throughout the Mediterranean, I hope it will become popular here at Spacca Napoli. Baccala con Peperoni Arrostiti is a recipe from Arthur Schwartz’s Naples At Table. Salty with sweet, chewy with tender, is how Arthur describes this dish. What can go wrong with something so simple as cod, roasted peppers, parsley, garlic, good olive oil, bread crumbs and gaeta olives? Thank you, Arthur! As always, I thank all of you and am grateful for another season that we all can be together.